Rogues, con-artists, thieves, and scoundrels, have had a certain duality of image for many centuries. On one hand, there’s a certain dashing attraction to the whole idea of living outside the rules, doing what you want – and getting away with it by being smarter, more skillful, and sneakier, then your victims. There’s the undeniable attraction of seeing people you dislike, or envy, being tricked or ripped off. On the other hand, it’s no fun when it happens to you – especially if, like most people throughout history, you just can’t afford it. Just as importantly, most of the population seem to feel that it’s wrong somehow – an instinctive attitude left over from life in small tribes, where everyone was easily identified, privacy was negligible, and cooperation was required for survival. Notions like “fairness” helped keep the group together and functioning – and so the surviving groups all had such notions embedded very firmly indeed. The tolerance of outright thieves has varied drastically thru the ages. While there have been times when thieves and bandits have been seen as the heroes and / or protectors of the common folk – usually on the theory that it’s better to be sheered then slaughtered – that sort of idea only tends to appear during regimes so grasping and oppressive that almost anything looks better. While religions and social philosophies do play a role, the major factor is – as always – purely practical. The amount of tolerance extended to thieves depends on just how much people can spare. In cultures of scarcity – where, if somebody steals from you, they eat while you and your kids go hungry – penalties tend to be physical, immediate, and drastic. Mutilation, various forms of torture and marking, and death were all historically common. Such cultures normally don’t take excuses either. After all, if you’re that desperate, too young to support yourself in any other fashion, or otherwise unable to take care of yourself, and demonstrably have no one who with both the means and desire to care for you, you’re going to die anyway – and it’s a lot less trouble for everyone else to get it over with quickly. Still, if someone with resources to spare is willing to take you on, it generally doesn’t take anything more than paying off the wronged party to get you off the hook. 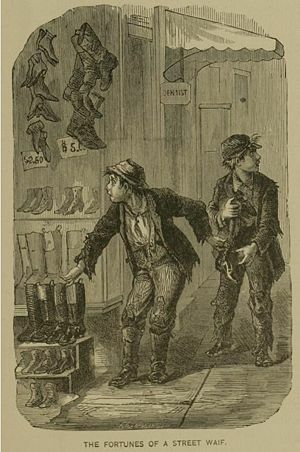 Thus the common-in-fiction (if vanishingly rare in reality) motif of the wealthy noble taking on the street child to spare him or her from the penalty for his or her thefts. In cultures where there’s enough, but not much extra, or in small groups where a fight with a wrongdoer may actually significantly endanger the group, the penalties tend towards exile or being made to earn your keep. That may be known as enslavement, forced labor, indenture, “transportation”, being apprenticed or bound out, or by and many other euphemisms – but the basic idea is always the same; you work or get thrown out. That can still be a death sentence, but at least you’re getting a chance – and it’s satisfies those feelings about “fairness” since your offenses were a lot less serious than in a culture of scarcity. A few of the better excuses – being very young, being blackmailed or compelled by someone holding a family member hostage, and so on – start to gain some traction as well. In a “culture of abundance” – such as the modern USA – petty survival-oriented thefts tend to provoke discussions of “why”, and “how can we fix this” focused on preventing future annoyances and “fairness” rather than on punishment. Larger thefts – intended to finance a long-term life of luxury – are often punished by simply making sure that the perpetrator does not get one. In cases where decent excuses apply – say a hungry small child stealing food – the “penalty” may be being turned over to a pack of social workers while the prosecution focuses on whoever was supposed to be responsible for feeding said child. Borderline cultures, and those who’s legal systems tend to lag a bit, often make complex distinctions, based on amount, age, race, citizenship or whatever strikes them as important – but that’s why a classical thief prefers soft cons (where, fairly or not, a good deal of the blame falls on the gullible victim), stealth if it’s at all possible, escape if something goes wrong, and will fight viciously if trapped. After all, if you’re going to die, why not do it in quickly in battle – and maybe take someone with you or escape if you’re lucky? Thus we have the classical fantasy “thief” – either a social or stealth specialist, typically going unarmored or, at most, very lightly armored so as to avoid unwanted attention and maximize their chances of a speedy escape. They’re capable of fighting fiercely in a pinch, but specialize in sneaky strikes from surprise, used to disable guards and make it hard to pursue them, rather than to kill – and rarely have the endurance for a long fight. They’re skilled, clever, and tricky. That does make them a bit of a problem in many group games. Unless everybody is running a sneaky character, stealth really won’t come up that often – and relatively minor magics can bypass the need for many skills. If you want thieves to play a major part in your game you’re going to want combat to be fast and deadly – making surprise, quick strikes, and avoiding unwanted combat vital – and magic (and magical healing) to be relatively subtle, making skills and clever application of that magic vital. This, of course, is why classical thieves have always been an awkward fit in d20 – where combat is slow, ablative, and often the default answer to problems, magic is fast, flashy, and anything but subtle, healing is quick, safe, and easy, and skills aren’t usually very important. Thus, at least in d20, they’ve mostly mutated into slightly-specialized combatants, with some skills more or less as an afterthought. Take heart though; there are still lots of games and settings where they do fit in.